5793 labyrinths found. Showing 3461-3480. Sorted by country, state, city, then zip/postal code. The labyrinth can be seen inside the fence next to the front entrance. The labyrinth is in a secured play area restricted to staff and children. 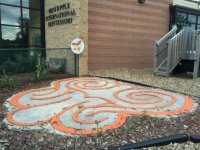 This labyrinth was built for a Girl Scout Gold Award project. It is a 30 ft labyrinth with grass paths and an inlaid brick outline. It is nestled into the corner of the building under the shade of mature trees. Labyrith will not be cleared of snow in the winter months. At the intersection of Ferndale and County Road 6, 1 mile west of Hwy 101. Open during regular church building hours when worship center is not in use. 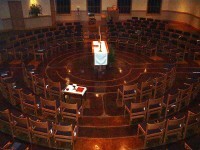 Contemporary design, based on Medieval type, set within the worship space. Chairs are incorporated into the design and need not be removed in order to walk the labyrinth. Wheelchair accessible only when chairs are removed. John and Pat Randall, private landowners. 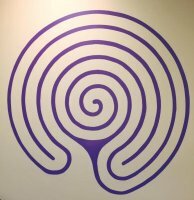 Wall labyrinth in the Calming Room used by tracing with the hand in wide arm movements. 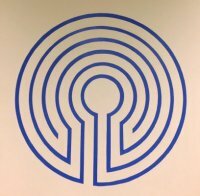 This wall labyrinth in a quiet hallway is used by tracing with the hand in wide arm movements. 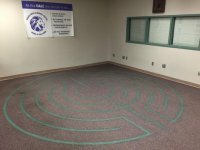 Blue classical wall labyrinth is near the Special Education area and is intended to be used by tracing with the hand in wide arm movements. Sophie's Heart Labyrinth a Celtic Double Spiral, was conceived from a past life when a minor nobles' daughter, Sophie, found her way in war to a Welsh healer and peddler, and they fell in love. Sophie's Heart Labyrinth is open all year as long as weather allows access (too much snow and we can't get into it). It is open to the public on Wednesdays, Saturdays and Sundays from sunrise to sunset and other times by appointment. The paths are too narrow for wheelchairs but the garden is accessible. 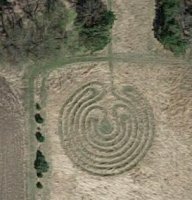 Everyone is welcome to the Labyrinth and for nature walks in the tree farm with permission. Guided walks are available for the tree farm. Sophie's Heart Labyrinth is a Celtic Double Spiral which is one spiral inside the other. Created as a memorial at my grandparent's lake cabin using stones that my grandfather collected from their travels around the world. Traveling on Highay 10 from Minneapolis, about 5 miles out of New York Mills turn North on #53. Go 5 miles and turn left on Nitche Lake Road. Go 1 1/2 miles to Sunset Beach Resort. Turn left. Welcome! 75' Chartres design. Circles were tilled and planted with prairie grass and wildflowers before the rocks were placed. During Park Hours - daily 7:00 a.m. to 10:30 p.m.
7-circuit classical mowed into the prairie specifically for use with horses. 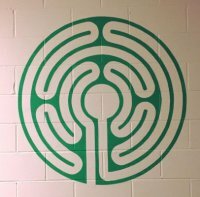 The labyrinth is located to the southeast of the center and parking lot, in a circle of trees. 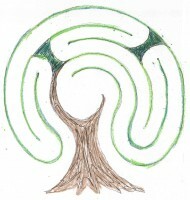 The labyrinth is always available to retreat and program participants. Others should call for availability. Contemporary medieval, 7-circuit concentric Circle of Peace designed by Lisa Gidlow Moriarty of Paths of Peace.